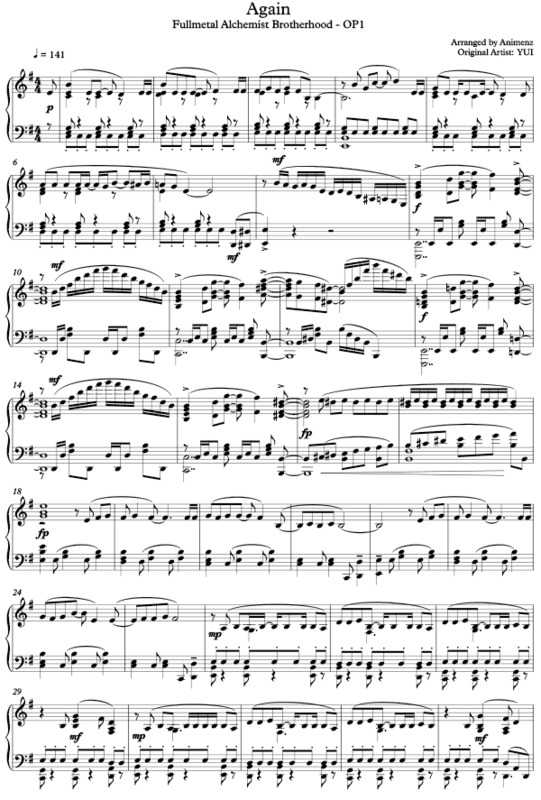 “Again Sheet Music” by Fullmetal Alchemist Brotherhood, “ Again Sheet Music” for Piano, Original key: G Major, number of pages sheet music PDF: 5, Video Piano cover and Lyrics song Again Sheet Music. “Again’” is Japanese pop rock singer-songwriter Yui thirteenth single, and first single after she went on hiatus in November 2008. Again Sheet Music Fullmetal Alchemist Brotherhood. Kono omoi wo keshite shimau niwa mada jinsei nagai desho? Deguchi mienai kanjou meiro ni dare wo matte’ru no? Kanaeru tame ni ikite’ru n datte Sakebitaku naru yo Kikoete imasu ka? ????????????????????????? ??????????? ??????? ????????????????????????? ??? ????????????? ?